Cards: Ultimate WLAF 1992, Wild Card WLAF 1992, JOGO 1994, JOGO 1995, JOGO 1997, JOGO 1999, JOGO 2000, JOGO 2001. Irvin Smith played collegiality for Maryland from 1985 to 1988. 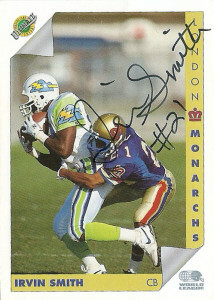 Unable to make it on the roster of the Jets, Irvin joined the London Monarchs of the WLAF in 1991. There he made 2 picks for 8 yards as the team finished with a 9-1 record as a talented defense shut down the Dragons in World Bowl I 21-7. 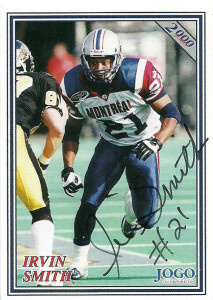 After a short stint on the Hamilton Tiger-Cats in the CFL, Smith returned to the Monarchs in 1992. Although the team did not meet the same success from the previous season, Irv stepped up and recorded another 2 interceptions that season. 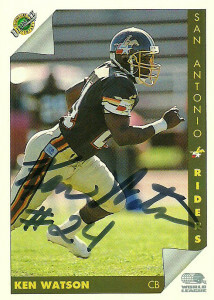 The league restructured after the season, so Irvin took his talents back to the CFL settling on the Saskatchewan Roughriders. In 1993 he returned to the NFL and was on the roster of both the Redskins and Vikings. southward, selecting locations such as Las Vegas, Sacramento, Baltimore, and Shreveport. Irv signed with the Baltimore Colts (later CFLers/Stallions). 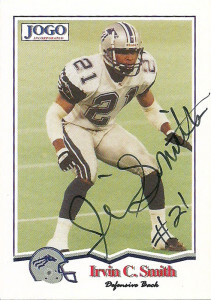 He made an immediate impact in Don Matthews defense, pulling down 6 interceptions for 97 yards where the Stallions made their first appearance in the Grey Cup. Although the team lost to the BC Lions, Irvin and the Stallions won the Grey Cup the following season and Smith had established quite a reputation as a dangerous defender to pass against. 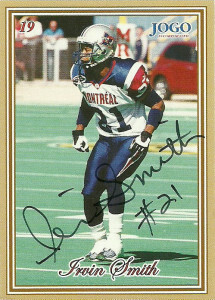 As the CFL contracted due to financial issues and the NFL gave Baltimore the Ravens, the Stallions moved up to Montreal and became the Alouettes in 1996. Irvin at first didn’t feel like making the move, but went ahead and joined the franchise in Montreal. It’d be a new chapter in Smith’s career, and a very productive one at that with 6 interceptions for 105 yards and a TD in ’96. He’d follow it up with two back to back 3 interception season in 1997 and 1998. 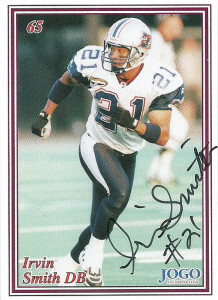 Smith had his finest season in 1999, hawking 7 interceptions for 51 yards and a touchdown. Irvin played for 2 additional years in Montreal, retiring after the 2001 season. Smith returned to the Baltimore area where he lives today and is a firefighter. I had been trying to track Smith down for sometime finally locating his address through the White pages. After sending to the address I found in Maryland, I got an RTS with a forwarding address in Florida. I turned it around and sent it to the other address the next day. About a month later I got this stuffed envelope full of cards and a nice letter from Irvin. 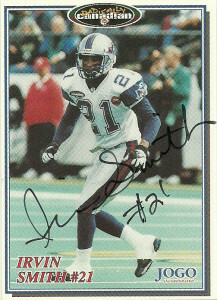 I had only sent Smith his 2 WLAF cards, but he stuffed it with all his JOGO cards and a nice letter. Ken went to school collegiality at Livingstone (now the University of Western Alabama). There he left an indelible mark on the record books for the school, where he held the school record for career punt return yardage with 690. Over his 4 year college career for the Tigers, Watson racked up 15 interceptions, 22 pass breakups, including a career high 49 tackles in his senior year. He was recognized as a 4 time All-Gulf Conference defensive back. 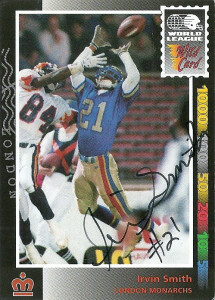 The Minnesota Vikings signed him as a free agent in 1989, and then later he joined the British Columbia Lions in 1990. 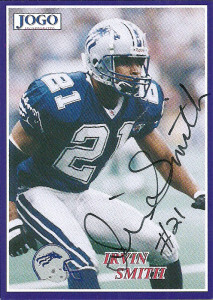 In 1991, the Riders made him their 2nd round pick of the positional draft among defensive backs. That season, he had 20 tackles and 2 picks for 17 yards playing across from Gary Richard, as San Antonio finished at 4-6. 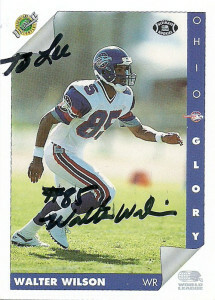 After the season Watson made the jump back to the CFL playing for the Stampeders from 1992-1993, the Baltimore Stallions 1994-1996, the Montreal Alouettes 1996-1997, Toronto in 1999, and finally Edmonton in 2000. After finishing school, Watson moved into coaching at the college level at Miles College from 2002-2005. He returned to his Alma Mater to coach DBs from 2005-2006. A stint at Minor High School in Birmingham, yielded him another opportunity to return to Miles where as of 2013 he remains the school’s defensive backs coach and defensive coordinator for the school.